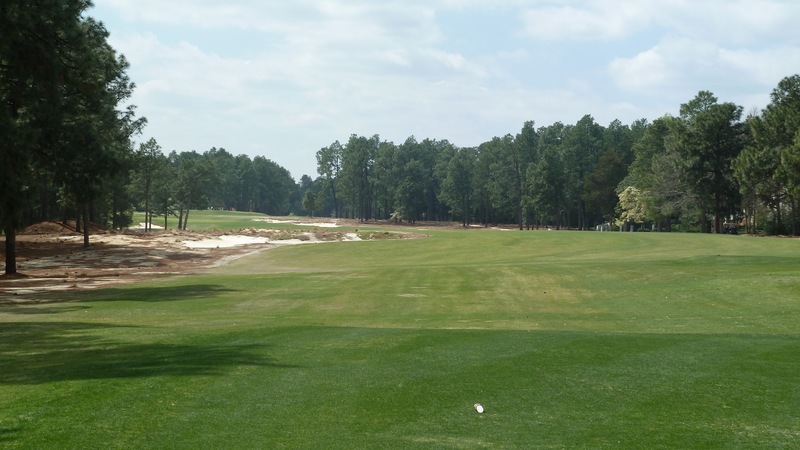 Back in June of 2007 (which now feels like decades ago in golf years) Pinehurst 2 was the first Top 100 course I played. 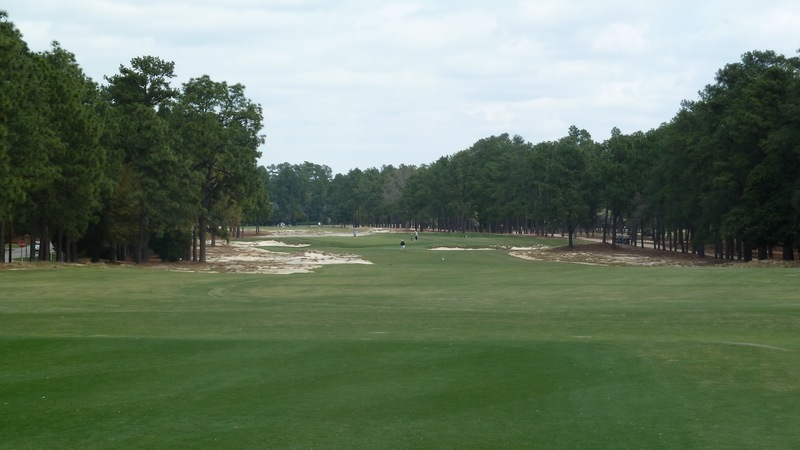 I happened to be in North Carolina on business and decided to swing on over to Pinehurst in order to play a U.S. Open course before my big trip to Shinnecock Hills the following month. Looking back, I have to laugh at my innocence that day back in 2007. I had NO inkling what kind of odyssey would be born from this round of golf – no idea at all. This website was not a twinkle in my eye, so even though I had my camera in my golf bag I didn’t take any photos. With no photos to share, my previous post on this website about Donald Ross’ masterpiece was pretty uninteresting. 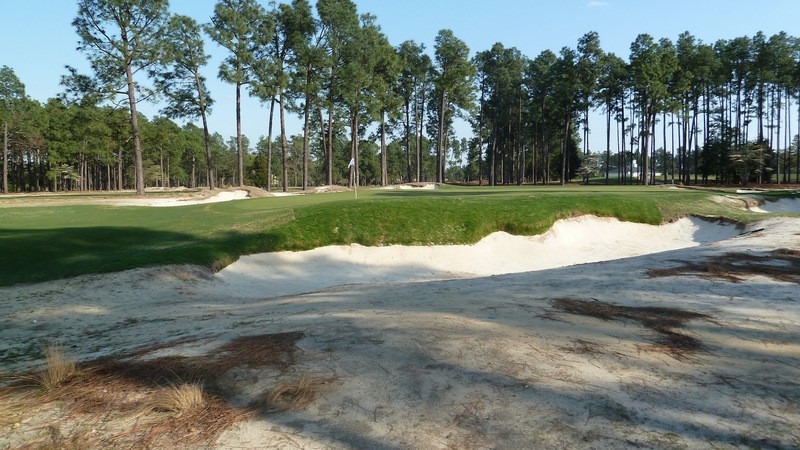 Now that Bill Coore and Ben Crenshaw have given Pinehurst 2 a facelift I’m going to give my treatment of the course on this website one as well. 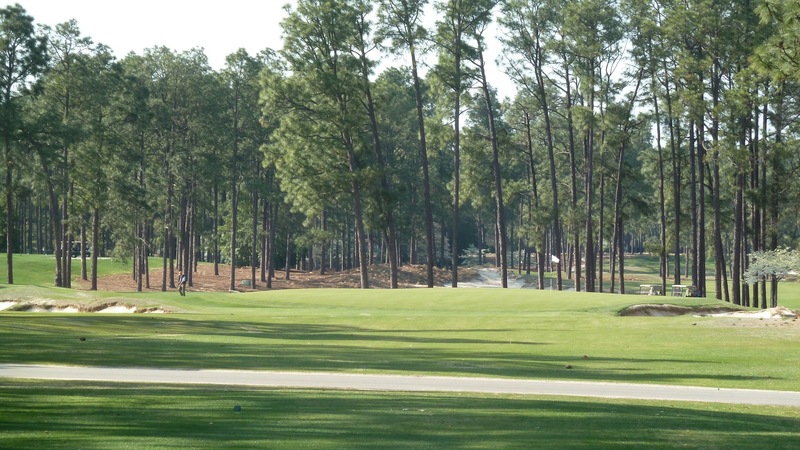 Pinehurst Resort is located in the sand hills of North Carolina and opened for business in 1895. The land was purchased for roughly a dollar an acre by Boston businessman James Walker Tufts who made his fortune in soda fountains. What Mr. Tufts began over 100 years ago has evolved into a premiere golf destination resort that today boasts eight golf courses and three hotels. The main lodge at Pinehurst Resort is loaded with golf memorabilia collected throughout the resort’s 100 year history which makes wandering the halls feel more like a visit to a great golf museum than being at a hotel. The resort is a wonderful place to spend a few days and relax with some good old southern hospitality. 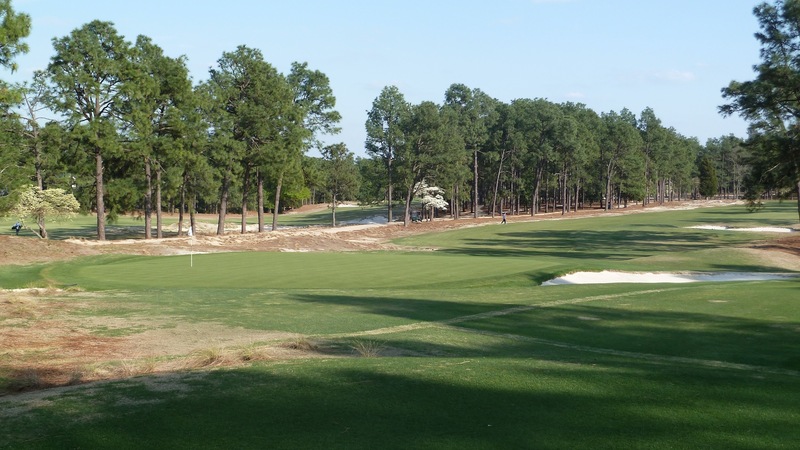 Although the first golf course was designed in 1897 it wasn’t until 10 years later in 1907 that the true masterpiece of Pinehurst Resort was opened. 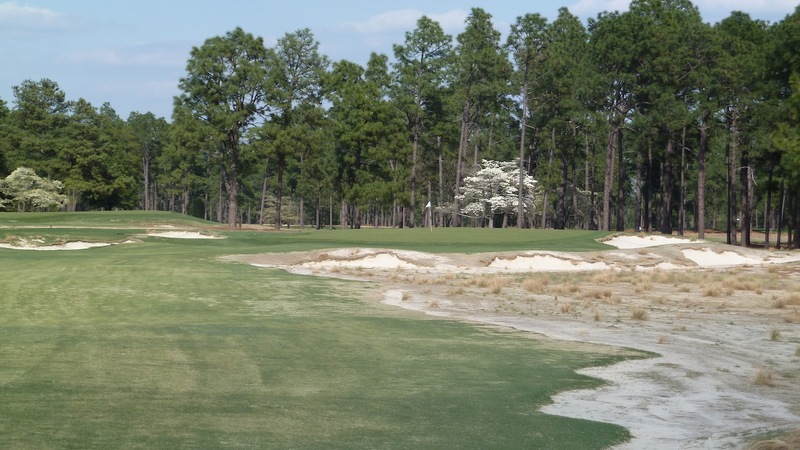 Donald Ross’ creatively named course “Number 2″ was then and is still now considered the crown jewel of the resort. Donald Ross who has hundreds of golf course designs to his credit did a large number of them having never set foot on the job sites. 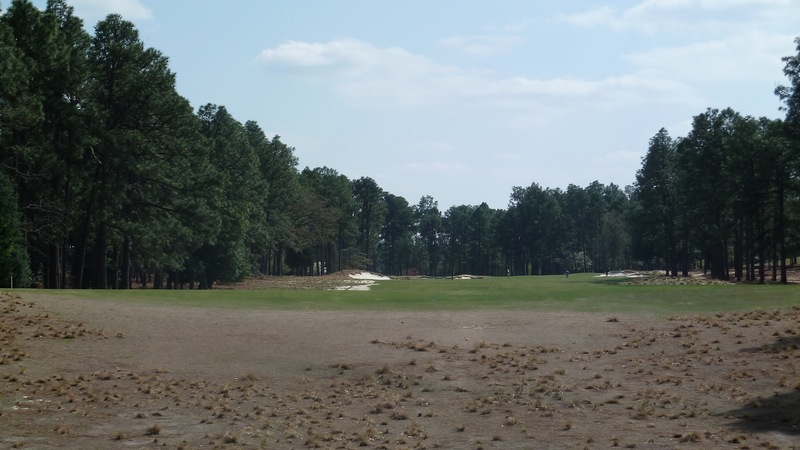 What makes Pinehurst different from these other sites is that Ross lived here and spent his free time tinkering with and tweaking the course until his final days. 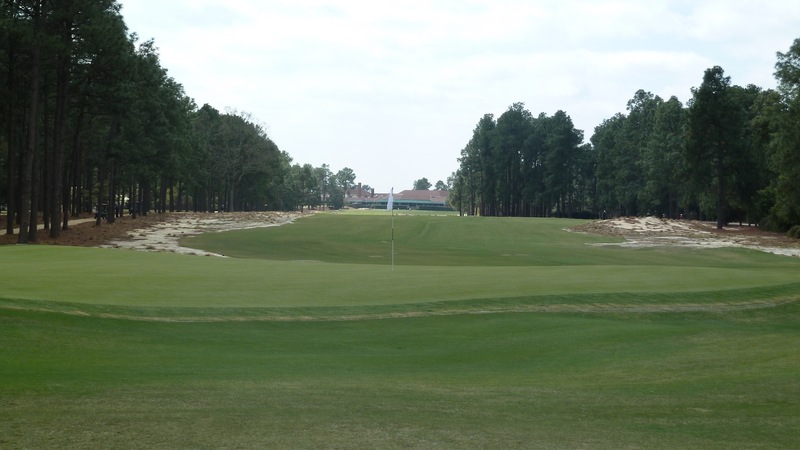 From a championship perspective Pinehurst 2 hosted the 1999 and 2005 U.S. Opens and is scheduled to host both the Men’s and Women’s U.S. Opens on consecutive weeks in 2014. 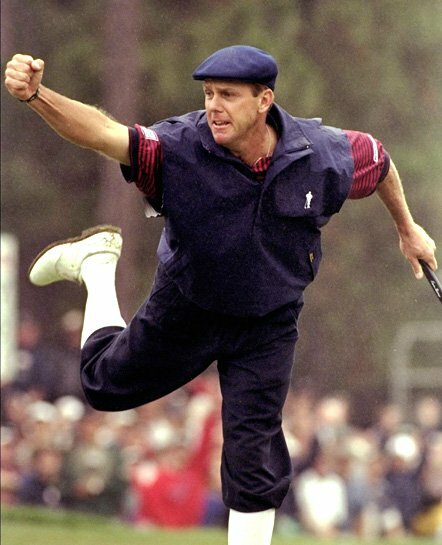 The most famous moment at Pinehurst is surely from the 1999 championship where Payne Stewart sank a dramatic putt on the 18th hole to win his second U.S. Open just months before he perished in a tragic plane crash. A photo of that famous moment is over to the left. 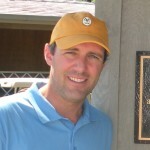 When I played the course back in 2007 I loved it, but truth be told I didn’t have anything to compare it to other than the handful of courses I had played at that time – none of which were even close to Top 100 quality . . . probably not even Top 1,000. 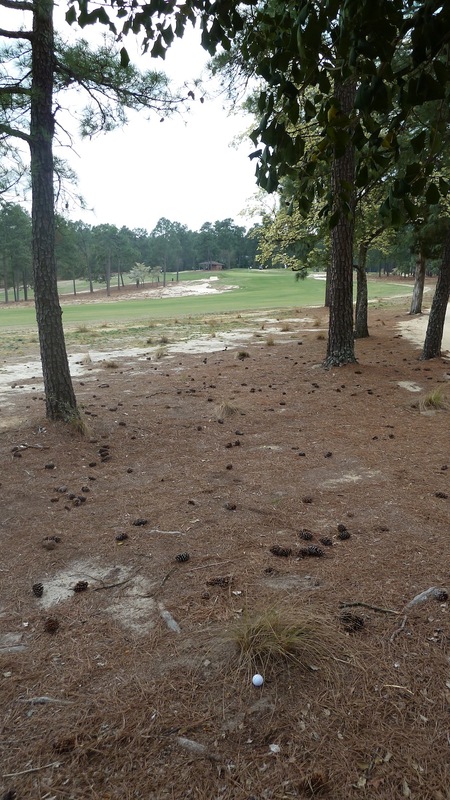 As time went by and I visited more top quality golf courses I began to reconsider my thoughts about Pinehurst 2. My feelings about the course just didn’t hold up the more courses I saw. 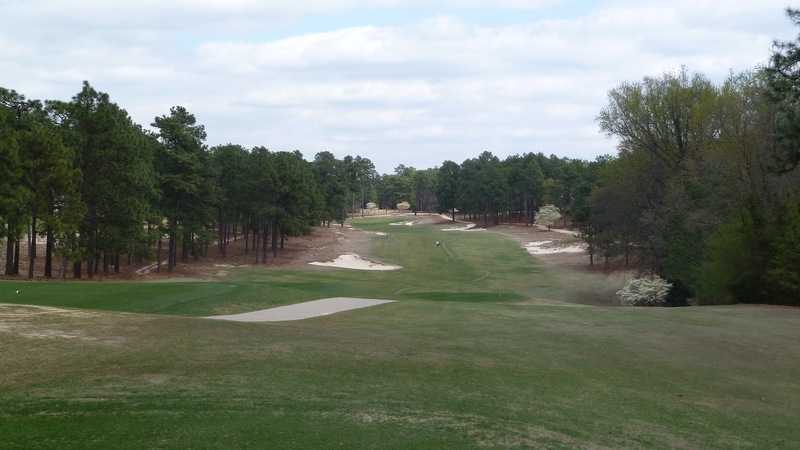 Since Pinehurst is just a 3 hour drive from where I live in Richmond I kept saying I was going to get back down there and take another spin around the course, but I never got around to it. Then, something wonderful happened . 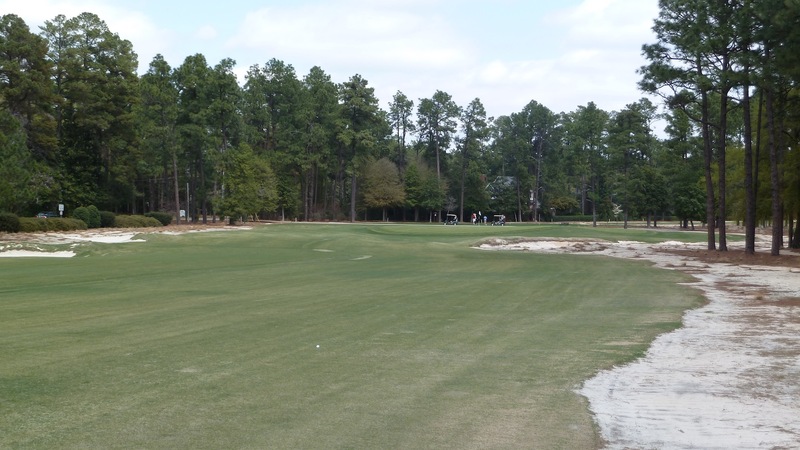 . . Pinehurst 2 shut down. 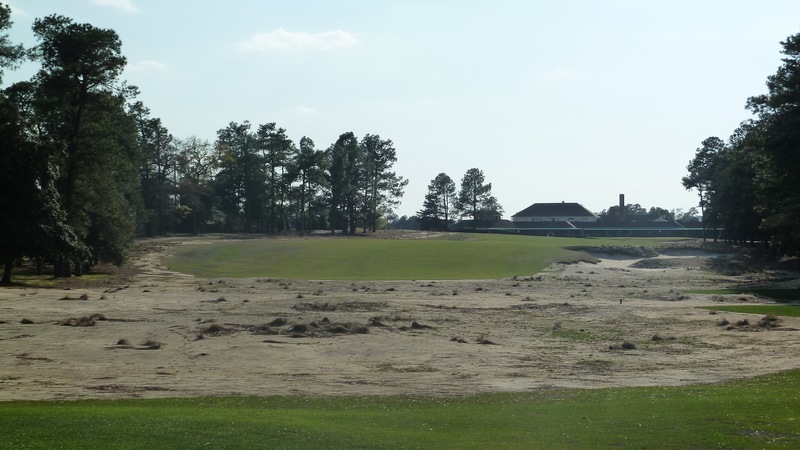 It’s not normally “wonderful” when a golf course shuts down, but when you have Bill Coore and Ben Crenshaw setting up shop on site with the intention to restore the course back to its original design I think it can only be described as wonderful. 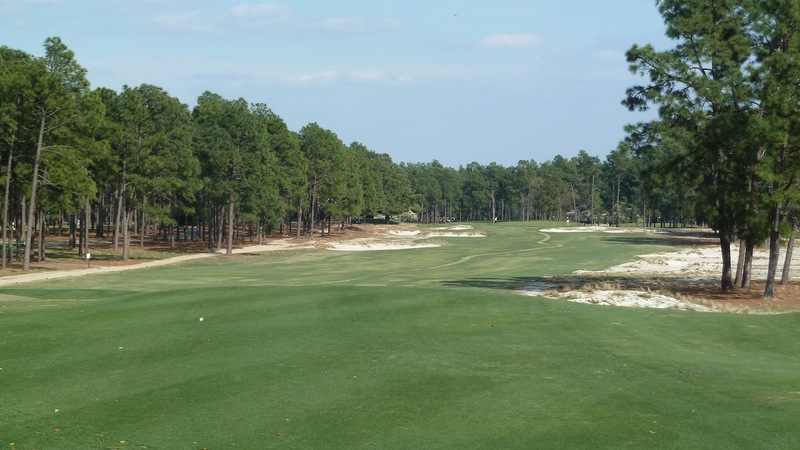 Over the years Pinehurst 2 had, like many classic courses, lost its way. The original design had been compromised and I believe Ross himself would be pleased with the arrival of the Coore & Crenshaw team. 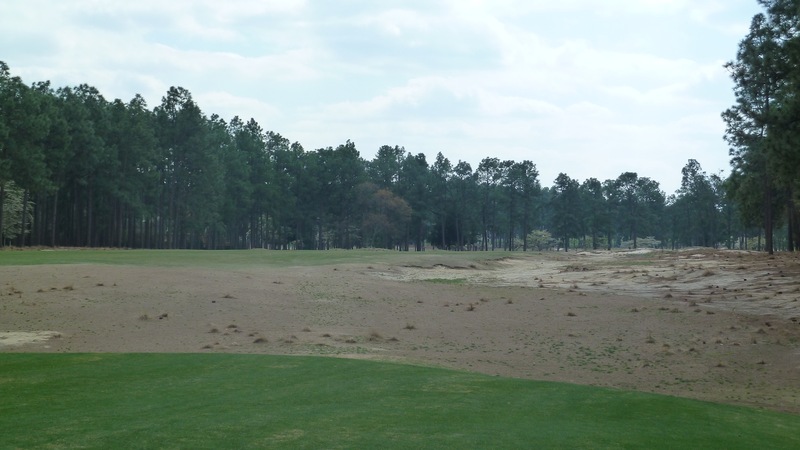 So, after spending the winter closed down for the restoration Pinehurst 2 was scheduled to reopen in March of 2011 which coincided perfectly with a trip I had planned to Pinehurst with three of my friends. I’ve played in a lot of great foursomes with a lot of great people, but this golf group is my all time favorite foursome. Of the four of us, three guys have known each other for at least 20 years and the newest guy has been hanging around for roughly the last decade, so there is a lot of history between us. Even though we are located in Virginia, New York City, Chicago and South Carolina there is never a lack of communication among us and we end up seeing each other several times throughout the year either through golf, business or social events. I have been accompanied by at least one of these three guys (two of them a couple of occasions) at 17 of the 70 Top 100 courses I have played to date. 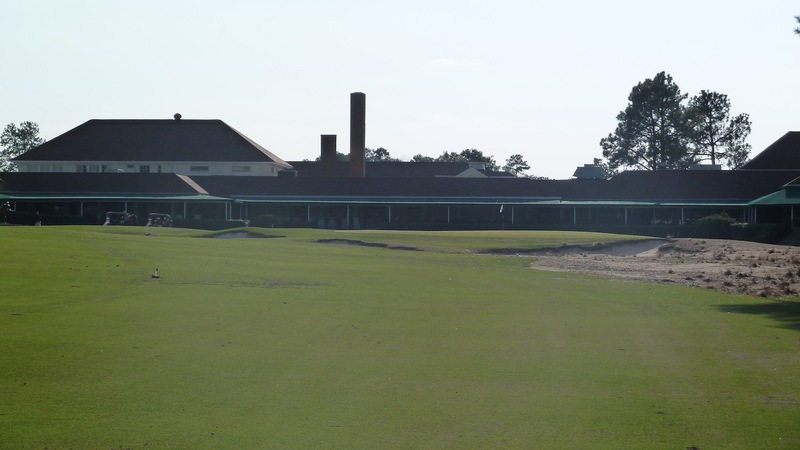 This visit to Pinehurst 2, however, will be the first time we play a Top 100 course all together. 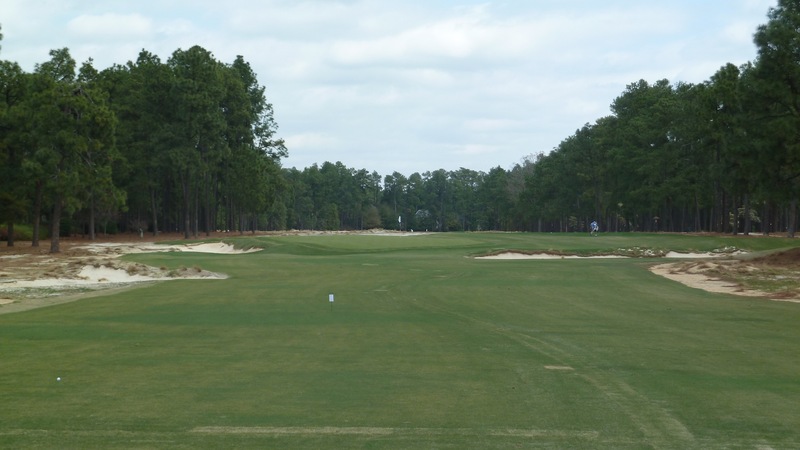 Getting to Pinehurst is a bit of a challenge for those traveling by air. 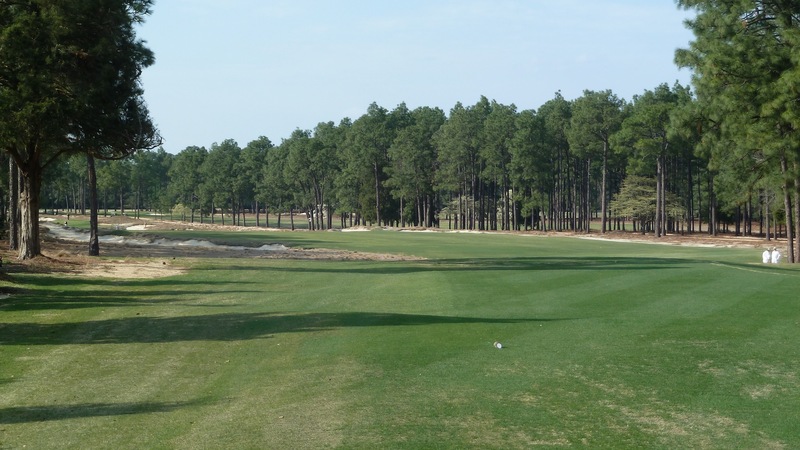 Raleigh is the nearest airport which is about a 90 minute drive to Pinehurst. My plan was to scoop up Steve and Jay, who were coming in from Chicago and New York, at the airport on my way down from Richmond and drive them into Pinehurst. Rob was driving up from South Carolina and we would rendezvous with him once we got into town. As we have grown to expect with this group there was a snafu. I don’t recall if it was a work commitment, family commitment or an airline problem but Steve ended up missing his scheduled flight out of Chicago. 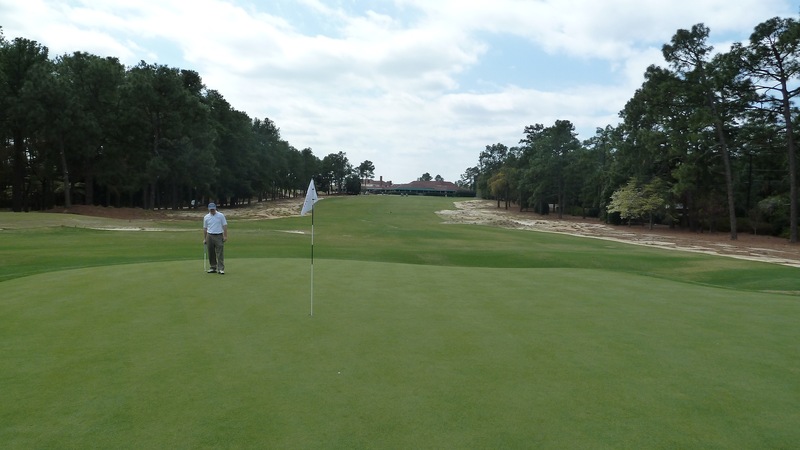 Unfortunately, he missed our first round at the Country Club of North Carolina but he managed to arrive in time for Pinehurst 2 . . . just barely. We were literally on the first tee getting ready to tee off when a maintenance cart screeched up and Steve hopped out. That’s what I call cutting it close. Since we were about to tee off we quickly negotiated the stroke allocation for our match and decided to play the 6,930 yard blue tees. When our caddies gave the word that we were clear the first ball went in the air. This hole is a soft start to the course with a basic par 4 that favors a straight shot down the middle. The photo below was taken just off the tee box. Below is a photo of the 1st green. Note the false front. We would find features like this on many of the greens here. Here is a look back down the hole from the back of the green. 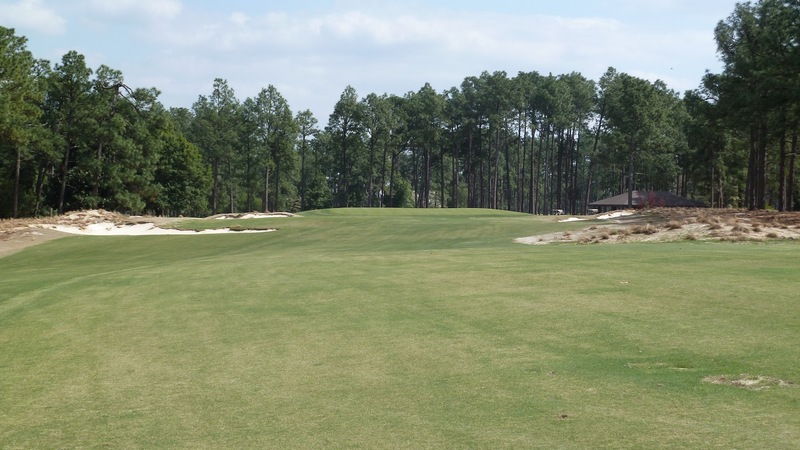 The 2nd hole, pictured below, is a long par 4 that turns a little left on the approach shot. The best line from the tee is to favor the left side of the fairway for the ideal angle into the green. Below is a look into the green. Again, note the way the green falls off at the front. The photo of the green below was taken from one of the bunkers near the green. 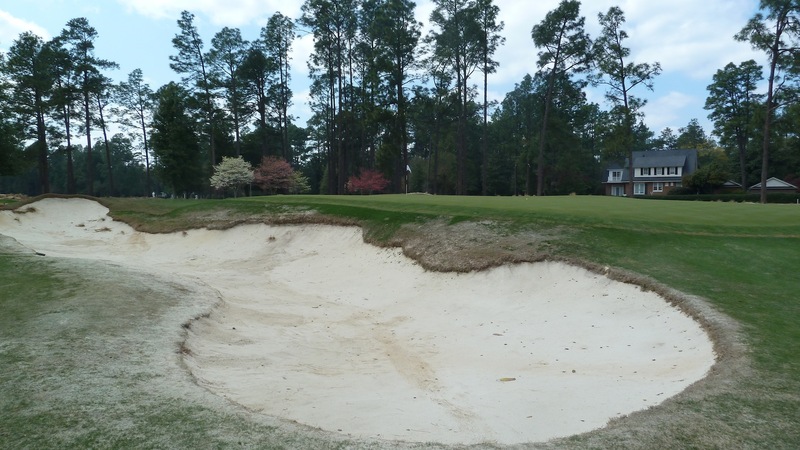 As can be seen the edges around the bunkers are not a crisply defined. 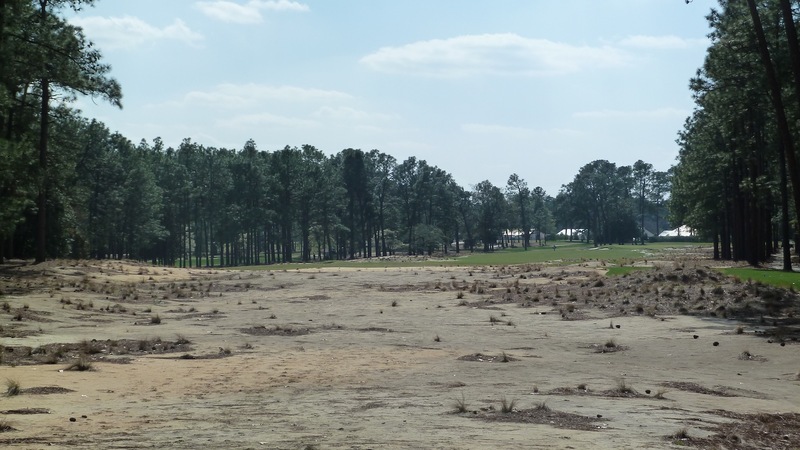 This is one example of the many details the Coore & Crenshaw brought back to Pinehurst 2 in an attempt to restore the original feel of the course. And here is a look back down the fairway from behind the green. This short par 4 is a great birdie opportunity after the difficult 2nd hole. 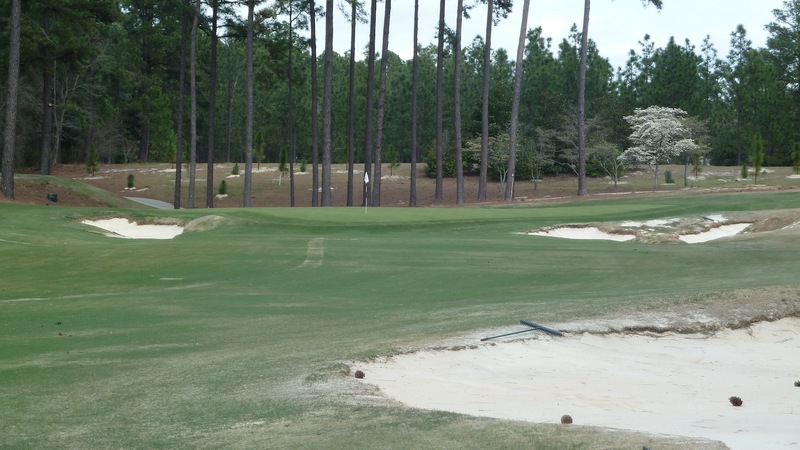 The bunker that reaches from the right side of the hole into the fairway must be avoided on the drive. The best way to steer clear is to hit a fairway wood or utility club from the tee. The photo below was taken from the tee box. The left side is the preferred angle into the green. The photo below was taken form just short of the bunker on that side of the fairway. Below is the view from the right side of the fairway just short of the bunker that creeps into the fairway. 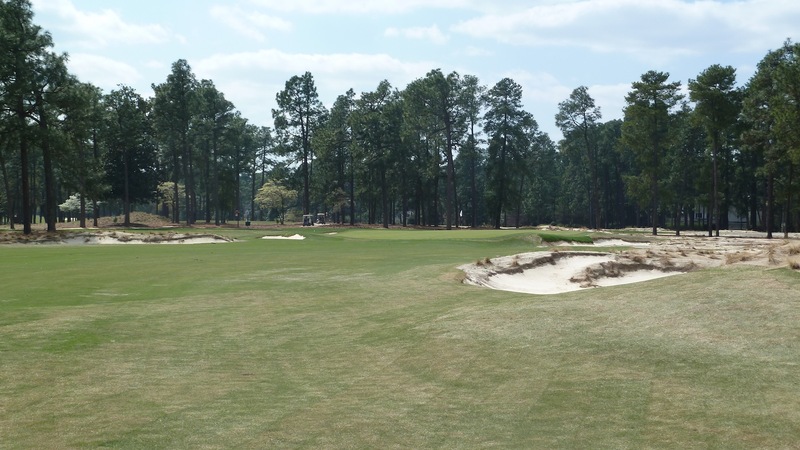 The 4th hole is the first par 5 on the course and the only downhill tee shot at Pinehurst 2. This hole is very reachable in two as drives will pick up some extra yardage on the downhill fall. The photo below was taken from the tee. Below is a view of the 4th green and the bunkers that protect it. 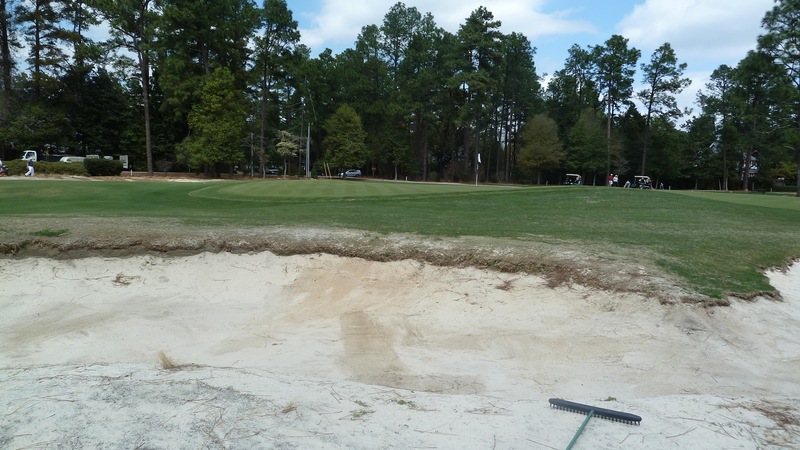 The bunker coming out from the right in the foreground of the picture is a deadly trap for players who don’t calculate their layup shot correctly as finding this bunker will result in the dreaded long bunker shot. 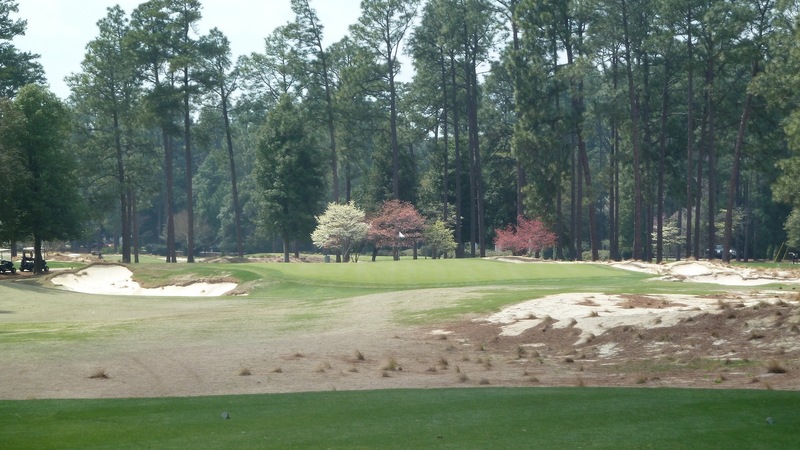 This hole is my favorite par 4 at Pinehurst 2. 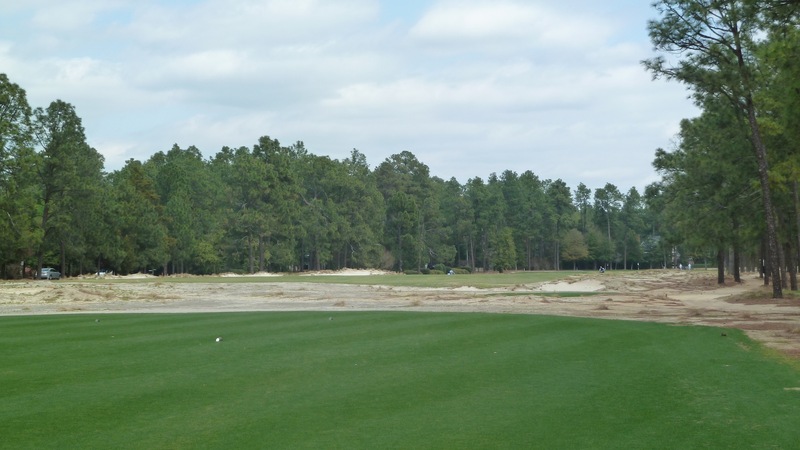 It is a beast at 436 yards and there is big trouble for misses on the left of the fairway. The photo below was taken from the tee. Below is a photo of Steve’s ball in the woods. Note the position of the ball behind the tuft of wire grass. This is a danger all over the course. With Coore & Crenshaw adding in this type of grass it makes drawing a good lie in the scrub area crucial to having a chance to recover from a bad shot. Here is a look into the green. And a closer look at the green itself. This shot back down the hole shows a little bit of the slope of the green from left to right. The 6th hole is the first par 3 and its a healthy one. Anything over 200 yards is long in my book. 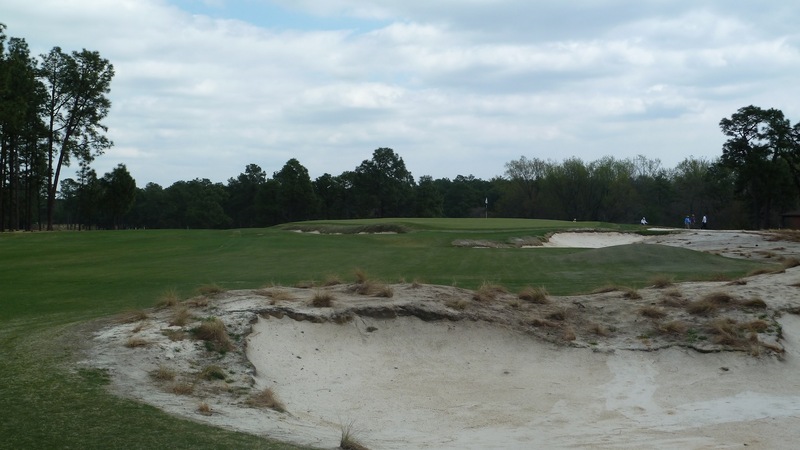 The green is open in the front, but the left and right side both have deep bunkers. Below is a view from the left side of the green. Here is another view from the left side of the green. 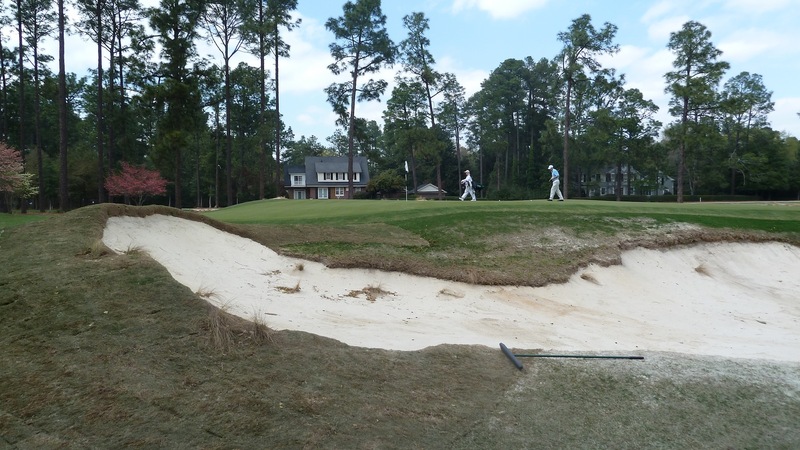 An embedded ball in the bunker face to the left side of the photo could be a real problem . . . especially for a right hander. Here we have a nice par 4 with a dogleg to the right. The bunkers in the distance towards the right side of the photo below can be carried by players who are long off the tee. From the blue tees its a good 275 yards to clear these bunkers. A much smarter play is off to the left of the bunkers. Below is a look at the green. Again, note that the front of the green is open and there are bunkers and waste areas on all other sides. The 8th hole is a beast of a par 4 at 469 yards. When I played here in 2007 this hole played as a very friendly par 5. A drive down the middle will do just fine here. Here we have a look at the green from about 100 yards out. 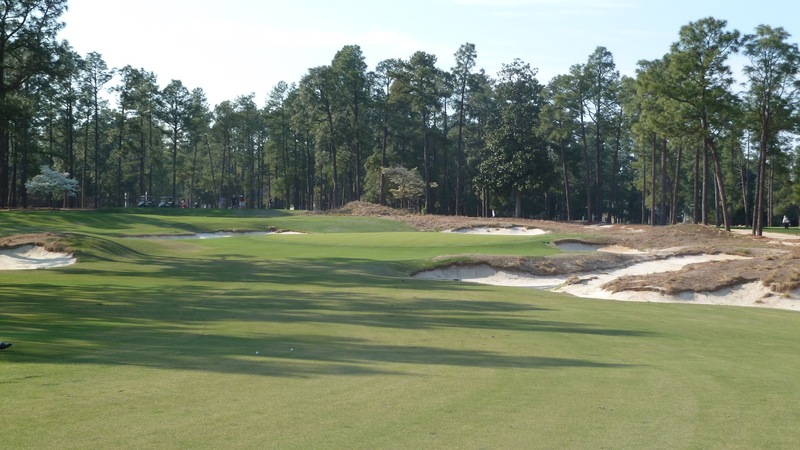 This tricky little hole was far and away my favorite of the par 3s at Pinehurst 2. The green is two tiered from left to right and the bunkers can spell disaster. Its imperative to hit the green on this hole and preferably on the correct tier for where the hole is cut. Here is a ground level view taken while walking up to the green. 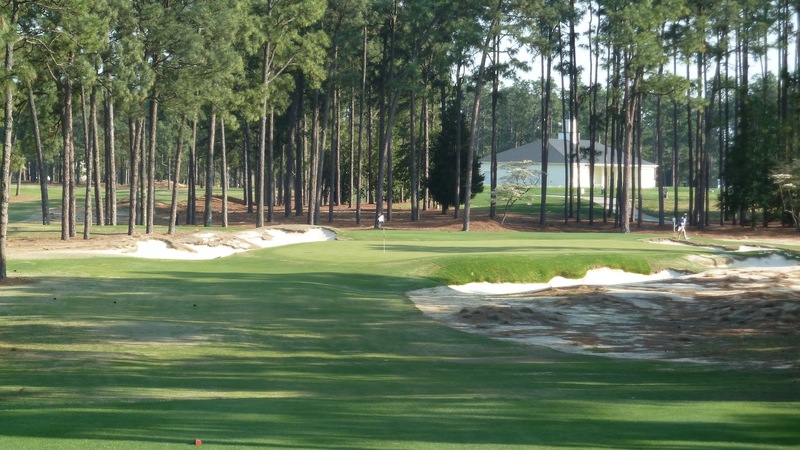 The start of the second nine holes at Pinehurst 2 isn’t an easy one. 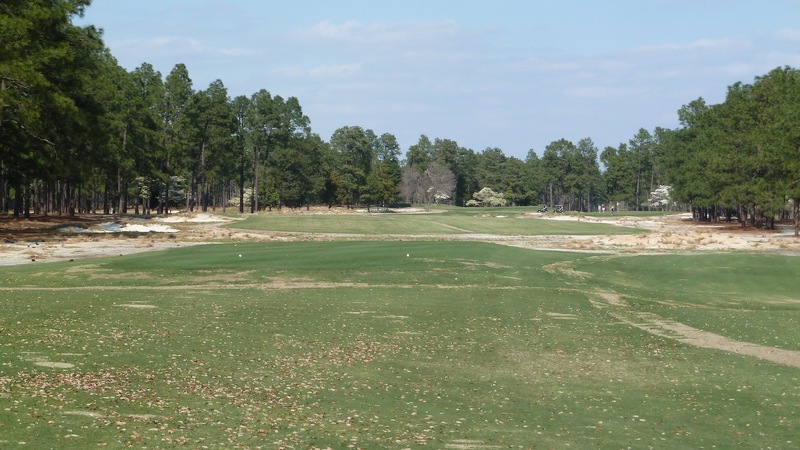 This long par 5 requires three solid shots to reach the green. 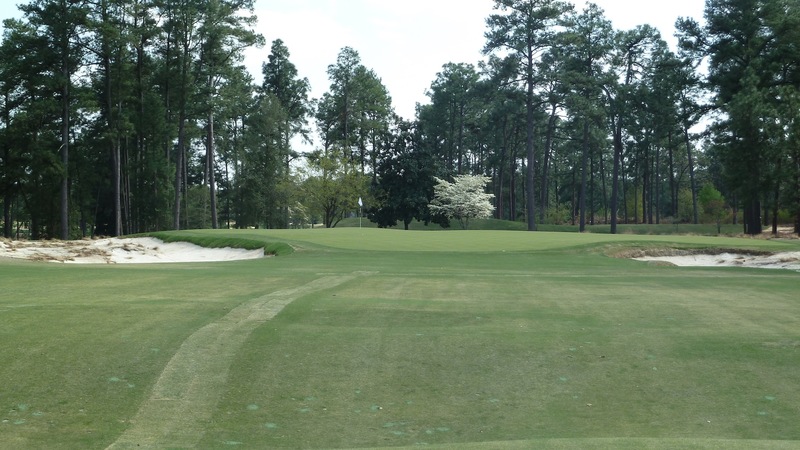 The hole, pictured below from just off the tee, is fairly straight with a little jog to the left at the end. Below is a close up of the 10th green. Note the line of new sod in the photo. One of the things that Coore & Crenshaw did was change the irrigation system to a center line system which only employs sprinkler heads down the middle of each hole. 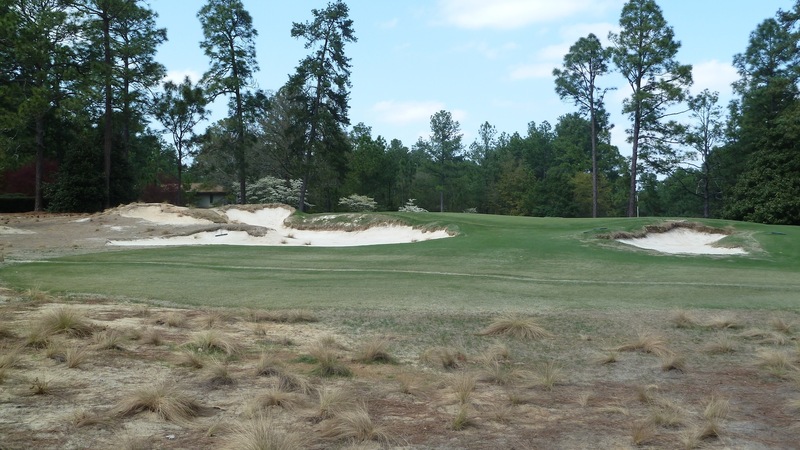 During the 2014 U.S. Open viewers might see a little more brown grass on the course than most are used to. Another long par 4 hole. 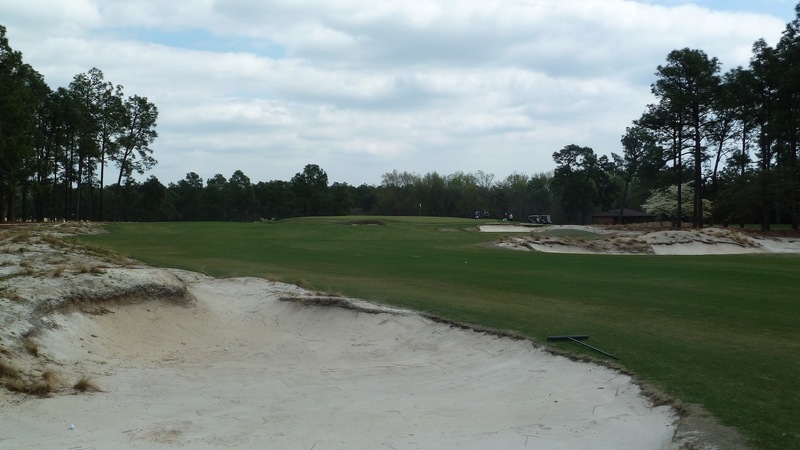 The drive here requires a carry over the sandy waste area in order to reach the fairway. It’s worth noting here that one of the big things that Coore & Crenshaw did was restore the sandy waste areas throughout the course. As can be seen in the photos so far there is no rough to speak of and anything that is not fairway or green is a waste area with a sandy bed. Coore & Crenshaw removed roughly 35 acres of grass to accomplish this. The photo below was taken from the 11th tee. Here is a view of the 11th green. Again we have a fairly open front with bunkers surrounding. This hole is a par 4 that is basically straight until the end where the hole moves sharply to the right. The photo below was taken from the tee. The closer to the right side of the fairway, the shorter the approach. 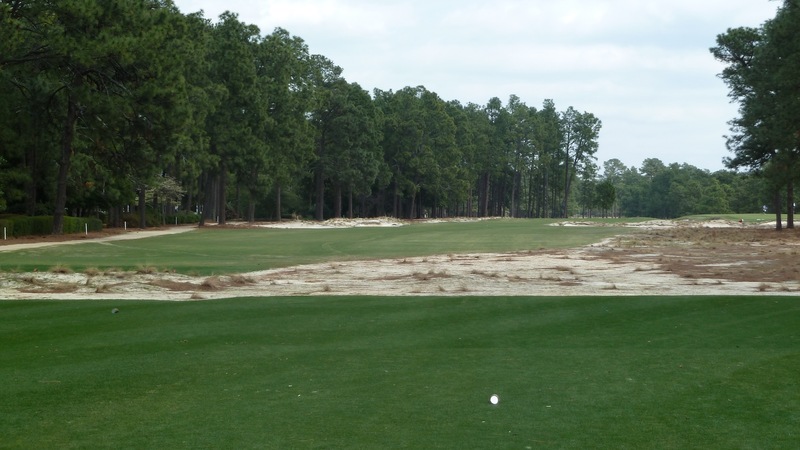 Of course, the closer the drive is played to the right side of the fairway, the more likely it is to find the bunker. Here is the view into the green. Most angles into this green are going to have to fly at least part of a bunker. I didn’t get any photos of this hole, but it’s a shortish par 4 to an uphill green, that caused me a little bit of trouble. Hence, the lack of photos. This hole is a nice par 4 that requires a straight shot from the tee. 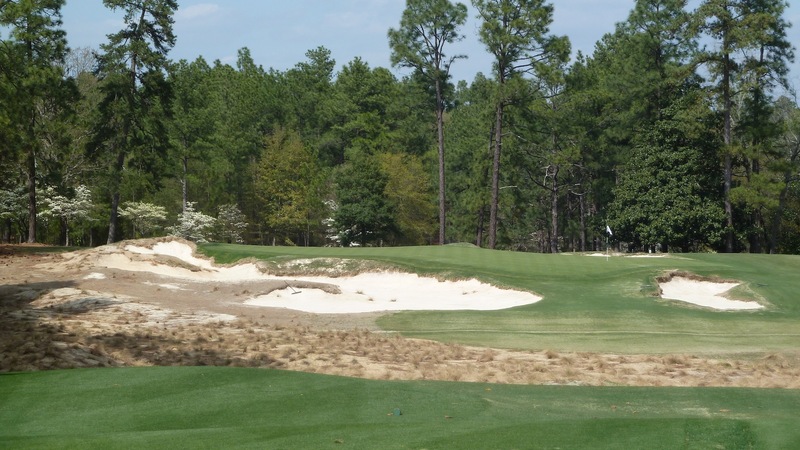 Too much draw or a hook on the drive and the second shot may be from the fairway bunkers down the left side of the hole. This par 3 is a mid-length shot to a crowned green. The preferred miss here is short as it will make for a much easier up and down than one from the bunkers around the green. 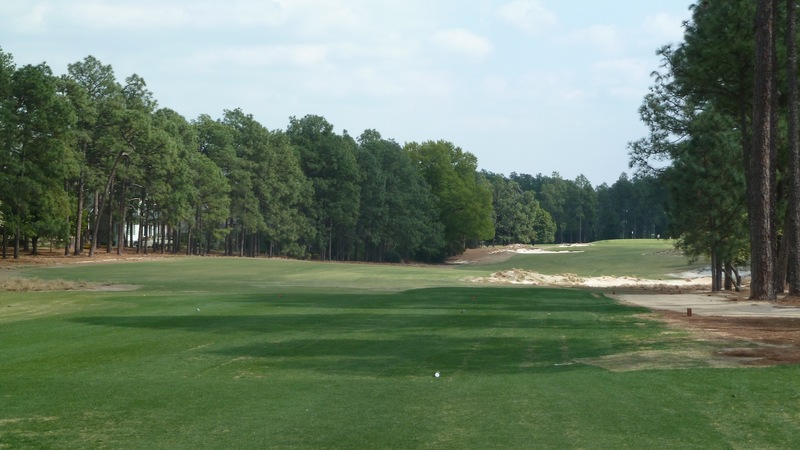 This shortish par 5 favors a drive with a draw. With a good shot from the tee this green can be reached in two by longer hitters. 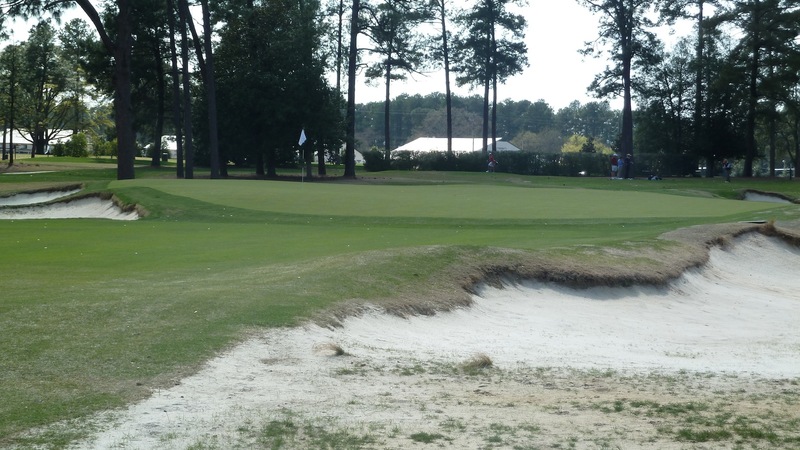 Players who opt to go for the green in two has best be accurate with their aim as there are a multitude of bunkers waiting to catch errant shots into the green. Below is a view of the green from over by the 17th tee. The green at this par 3 hole is a narrow affair that sits at a precarious angle. When the hole is cut in the back tee shots will have to carry the bunker on the right side of the green. Here is a view of the green from the right side. The finishing hole here is a par 4 that plays uphill back to the clubhouse. The photo below was taken from the tee box. Here is a view of the approach into the green. This is of course the green where Payne Stewart made the winning putt to clinch the 1999 U.S. Open. 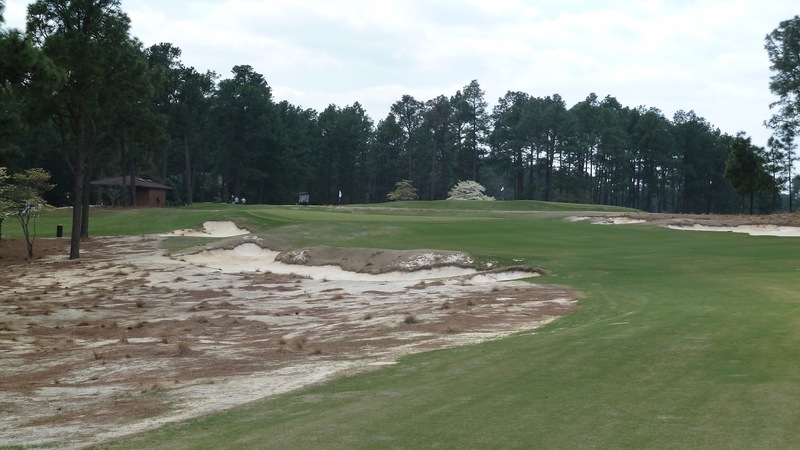 Now that I’ve made another loop around Pinehurst 2 I have to say that the restored version of the course is FAR superior to the course I played in 2007. Post-restoration, the course has infinitely more personality and texture than before and its much more fun making recovery shots from the sandy waste area than from thick bermuda rough. I’m sure that Donald Ross would be pleased as can be to see the work Coore & Crenshaw did to bring his masterpiece back to its original glory. 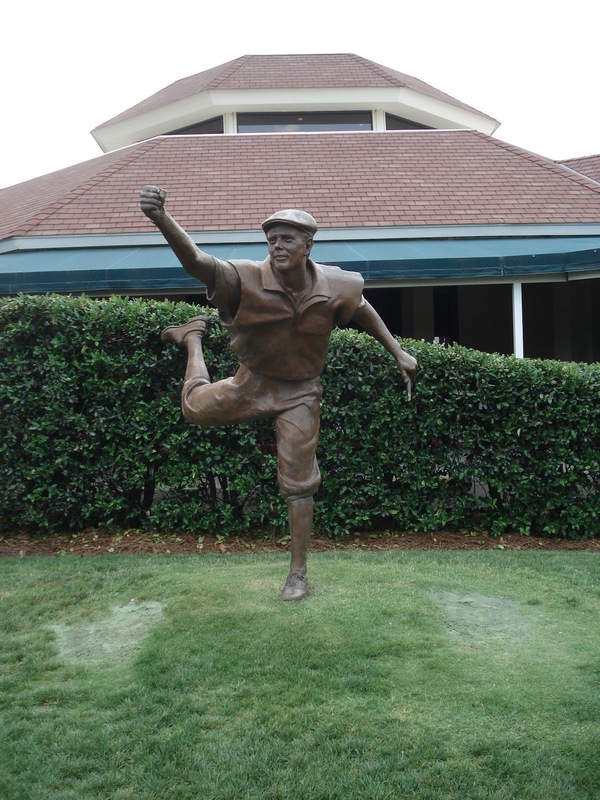 Oh yeah, after you finish your round don’t forget to stop by at the Payne Stewart statue and pay your respects! What month were these pictures taken in. Played No. 2 today with my son. What an experience. I haven’t played as many of the Top 100 as you, but I have to say it is the hardest course I’ve ever played. 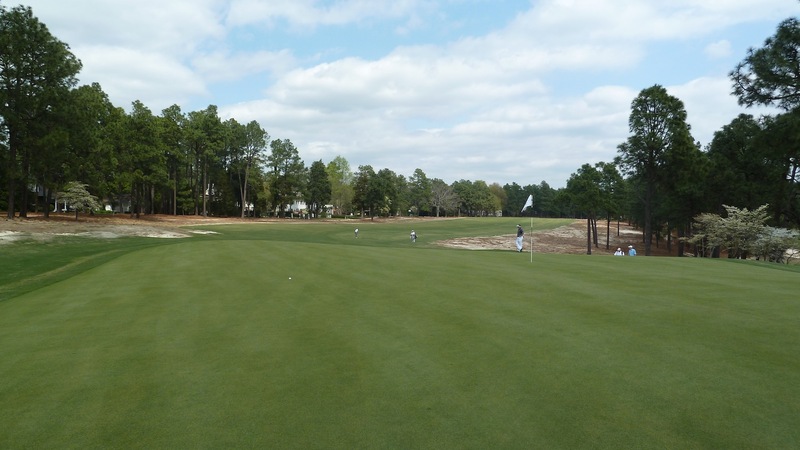 I didn’t think the tee shots were daunting, nor did I find the natural areas bordering the fairway all that penal, but a player’s short game is going to be exposed here – for better or worse. Iron shots are at such a premium. 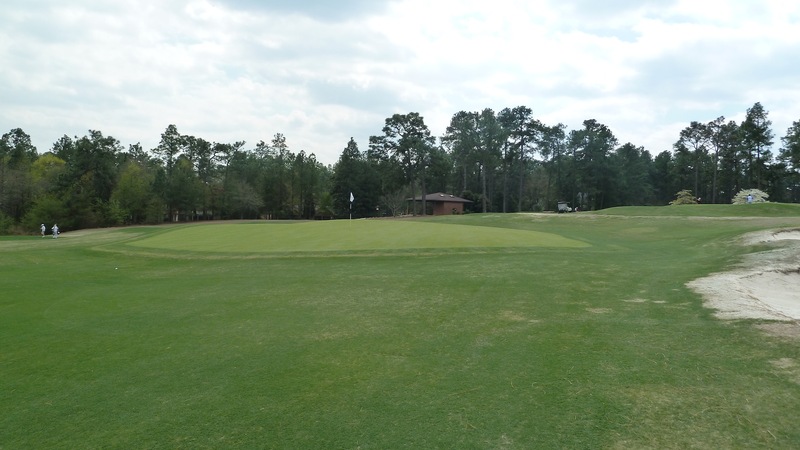 You basically have a five-yard square on most greens to land an approach to have a decent putt. Greens-Briefly-in-Regulation should be a stat kept here. Once, I even had to chip after I putted. Perhaps I should consider myself fortunate that it was only once. I found the par 3s to be extremely difficult, yet the par 5s to be very scoreable. If you are a 5+ handicap going here for the first time, here is the best advice I could give: practice putting from low areas off the green. The collection areas are tightly mown and can make chipping a nightmare for all but the best of players. It takes a while to get used to the speed of these shots so practice these more than you do chipping.